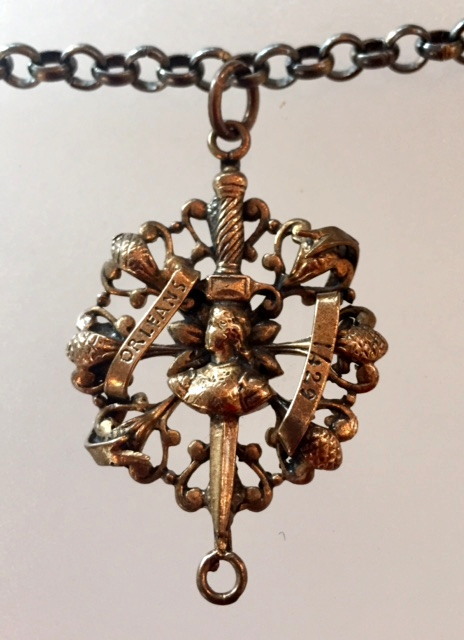 A historical French Saint Joan of Arc Medal featuring this powerful Saint with her Sword, Thistle, Orlean and the date of the battle. During the Hundred Years’ War, the 17-year-old French peasant Joan of Arc leads a French force in relieving the city of Orleans, besieged by the English. Joan of Arc was canonized as a Saint on May 16th, 1920. She is the patron Saint of France and soldiers. The Thistle frequently appears with her; and represents Bravery, Devotion and Strength. It is the official Flower of the Provence of Lorraine, where she was born. Cast from the original antique European medal; over a century old, this lovely reproduction is hand crafted. It is Solid Bronze and aged to a wonderful old world patina. Medal is 1 1/8" by 1.5", Rollo chain is 22" long.